How Long Should Ash Wood Season for Before Being Burned? Burning firewood to warm your home or to cook a meal is one of life's most basic activities. While it may be tempting to grab the closest log regardless of its condition or origin and throw it into the fireplace, choosing the right piece of wood will make your night in front of the fire warmer, cleaner and safer. Ash is popular wood for fireplaces and campfires. Seasoning prevents you from burning wet wood. Wet wood releases large concentrations of smoke while the wood burns. In addition to being a generally unpleasant sensation, it represents a potential health hazard. Wet wood is inefficient because it releases a lower percentage of its energy as heat, in comparison to dry wood. 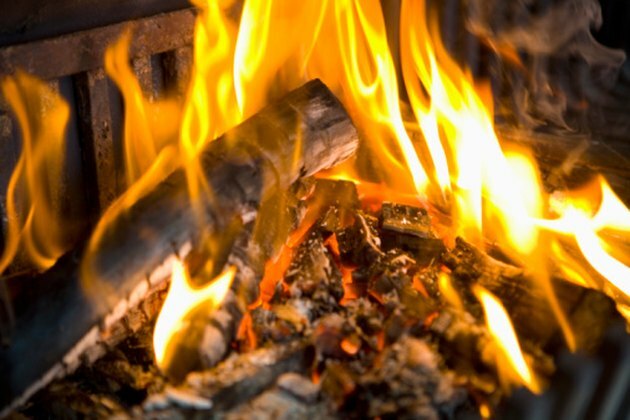 To burn properly, the moisture content of your firewood should be between 15 and 20 percent. It takes several months to remove the moisture from green wood. Seasoning is a natural process. The critical element is that moisture evaporates from the wood. The safest and surest means by which the moisture evaporates is simply to let the wood sit and let nature carry on. Season wood by stacking it in place where air will circulate around and through the stack. Protect wood from absorbing water, either from rain or from the ground. The process to season ash takes between six and 18 months. Unless you have seasoned the wood yourself, it is sometimes difficult to determine if the seller has seasoned the ash for the standard six to 18 months. Look for logs with a dark color and cracked ends. The cracks should radiate from the center of the log like bicycle spokes. The log should feel lighter than a branch of a similar size. Hit two pieces of firewood against one another and listen for a sharp cracking sound. If the wood is wet, hitting two pieces together will yield a dull thud sound. Peel away some of the bark to confirm the absence of green coloring. Whether or not wood needs seasoning is rarely ever at issue with any other type of wood apart from ash. A lore has developed around ash to suggest that it is acceptable to burn it while it is still green. The confusion may stem from the fact that ash has roughly 33 percent moisture content. In contrast, poplar has a natural moisture content of 66 percent. While 33 percent is low, it is not low enough to burn properly. In the end, you must season ash as you would any other green wood for at least six months under proper drying conditions. How Soon After Cutting Wood Can You Burn It? What Happens When You Burn Wet Wood in a Fireplace?